“Brickhead Yemanga” by James Tyler, shown here, is one of more than 50 massive art works that grace Pratt Institute’s 25-acre sculpture park. It’s both breathtaking and serene. 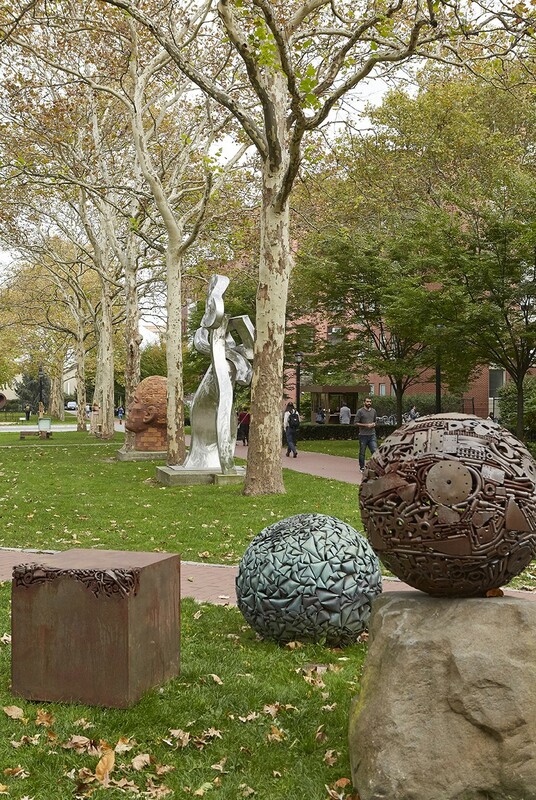 Pratt Institute’s 25-acre sculpture park, covering the entire Clinton Hill campus, is the largest in New York City – and yet remains almost a secret even to many Brooklynites. More than 50 sculptures from around the world, by both well-known and emerging artists, are installed amid Pratt’s grass-covered lawns and historical buildings on a rotating basis. The sculpture park was recognized as one of the 10 best college and university campus art collections in the country by “Public Art Review” in 2006. For more than 20 years, Professor David Weinrib curated the remarkable exhibition. Professor Weinrib died on Feb. 6 at the age of 91. A Pratt spokesperson said that Weinrib tackled his work with tremendous commitment. In curating the ever-changing exhibition, Weinrib grappled with numerous design challenges — in particular, how to integrate towering pieces of art with the campus and its various building facades, architectural styles, and open and closed landscapes. Weinrib, assisted by Associate Curator Harry Gordon and Preparator Jacques Zanetti, worked personally with the sculptors to find specific sites for their works. “The result of our collaboration is a sculpture park that enriches our students’ experience of campus life and provides an oasis for the Brooklyn community and the general public as well,” Weinrib wrote. Those interested in viewing the art work may visit the Pratt campus from 7 a.m. to 7 p.m.
Weinrib exhibited his own artwork at the Howard Wise, Royal Marks, Heller, Bernice Steinbaum and Max Hutchinson Galleries. His ‘70’s cast resin pieces are in collections that include the Walker Art Center, the Whitney Museum, and the Los Angeles County Museum of Art. He also exhibited at the Jewish Museum, the ICA at the University of Pennsylvania and the Grey Gallery. His work of the last 20 years included computer-aided laser-cut technology forms and images of his body, photographed by his wife JoAnne. He is survived by his wife JoAnne, and his son Abel (from a previous marriage to Karen Karnes).